There’s a new entrant in the Amy Brown Collection of silver rounds for sale from the Anonymous Mint. Although the popular six-round series concluded earlier in 2018, there’s a new design from Brown available through Anonymous Mint that captures the imagination for Halloween. Right now, 5 oz Proof Silver Amy Brown Collection Haunted Pumpkin Patch Rounds are available to purchase online at Silver.com. Rounds ship to you inside of protective plastic capsules that include a Certificate of Authenticity! A fairy and haunted pumpkin patch feature on the obverse. 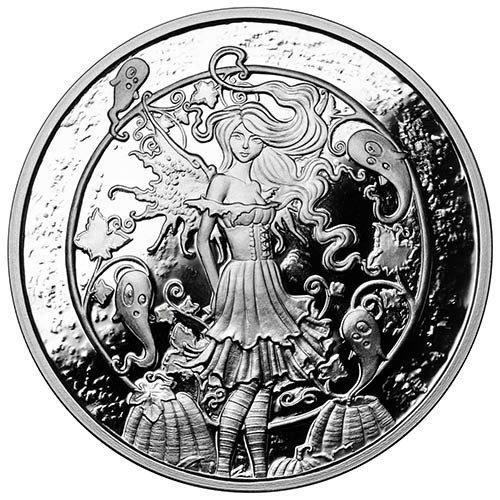 The fairy Dusk is found on the reverse. Artwork by Amy Brown, release developed by Julie Lindquist. Individual serial numbers on the edges. Each of the 5 oz Proof Silver Amy Brown Collection Haunted Pumpkin Patch Rounds are available to you with a protective capsule to ensure the condition of the round. Included with purchase is a Certificate of Authenticity that reflects the same serial number you’ll find on the edge of the round itself. The 5 oz Amy Brown Collection Haunted Pumpkin Patch Rounds have the lowest mintage figures in this special release. Set at just 500 in total for each of the three 5 oz versions, these rounds are extremely limited and likely to sell out quickly. The proof version of the Haunted Pumpkin Patch round has frosted design elements and mirrored background fields. 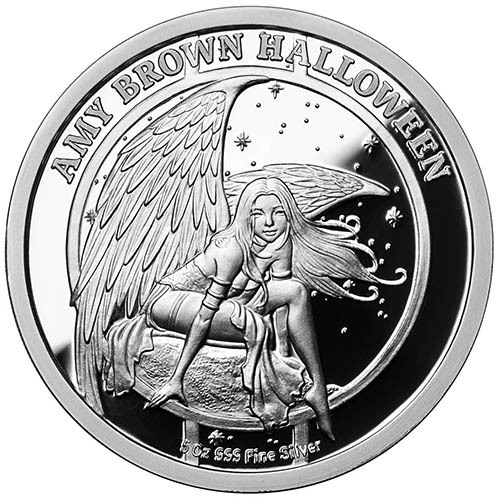 On the obverse side of each 5 oz Proof Amy Brown Collection Haunted Pumpkin Patch Round is the image of a fairy standing in a pumpkin patch. This isn’t your average pumpkin patch though as it is haunted by four small ghosts, two of which are creepily playing with the fairy’s hair. The scene is completed with pumpkins at her feet, as well as the vines and leaves of a pumpkin encircling the moon in the background field. The reverse of all Amy Brown Collection Haunted Pumpkin Patch Rounds features the popular Dusk design. The image of Dusk includes a powerful fairy sitting on a high, rocky perch. Her large, bird-like wings can lift her into flight in seconds, but her dreamy gaze suggests she’s enjoying the calm of the early evening as twinkling stars come out in the background. Anonymous Mint developed the special-issue Haunted Pumpkin Patch release with lead coin designer Julie Lindquist and Italian Master Sculptor Luigi Badia again providing the carving on dies for the production process. If you have any questions, please don’t hesitate to contact Silver.com. Our customer service team is available to you at 888-989-7223, online using our live chat, and via our email address.